Free Wi-Fi an outdoor pool cabanas and an on-site restaurant await at the non-smoking Hotel Paradox close to shops and restaurants in the heart of downtown Santa Cruz. 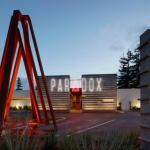 Decked out in sleek modern furnishings the 170 non-smoking rooms at the Hotel Paradox feature bathrobes flat-panel TVs iPod docks coffeemakers sitting areas and free Wi-Fi. Relax in a cabana or warm up around a fire pit at the year-round outdoor pool area. The hotel's restaurant and bar offers wine beer and American comfort food. Other amenities include a fitness center lending library business center and concierge service. Less than a block from San Lorenzo Park the Hotel Paradox is surrounded by restaurants and shops and is a 10-minute drive from the Santa Cruz Beach Boardwalk. Drive five-and-a-half miles to Capital Village or seven minutes to Lighthouse Field State Beach. San Jose International Airport is 33 miles away.